Genuine Vauxhall Owners manual set for the ASTRA H from 2004 until 2010. Commonly found in the vehicles dashboard glovebox, this item provides detailed instructions on all functions and operations of the car, including the factory CD30 MP3 Audio systems. Models covered by this manual. VAUXHALL ASTRA 3 DOOR, 5 DOOR, ESTATE, & VAN MARK 5 PETROL & DIESEL 2004 - 2010 OWNERS HANDBOOK / MANUAL COVERS: 1.4 Litre 1.6 Litre 1.8 Litre 2.0 Litre TURBO 2.0 Litre VXR 1.3 Litre CDTI 1.7 Litre CDTI 1.9 Litre CDTI NOT HAYNES. Vauxhall Audio Manual CD 30,MP3. Very comprehensive Manual plenty of detailed information here. (MY REF YJL 549). This is a GENUINE Vauxhall item. The inner pages are in very very good condition. It has very slight marking to the outer covers. ((MY REF: VMJL 196). MAKE AND MODEL -Vauxhall Astra. 1) The Vauxhall Astra Quick reference guide. This is a GENUINE Vauxhall item. 2) The Vauxhall CD 30 and CD 30 MP3 Audio handbook. It covers Astra 3 Door and 5 Door Hatchbacks - Estates from 2006 - 2010. This is the instruction book for the following factory standard Radio Cassette / CD Audio Systems found in many Vauxhall Models from mid 2003 onwards, including the Corsa, Combo, Astra and Vectra. Print Dates 2003 & 2004. 2.0 Turbo Petrol engines - 177 kw VXR. MAKE AND MODEL -Vauxhall Astra. This is a GENUINE Vauxhall item. (MY REF: SP 130). It has a number written on the rear cover -see last picture. DATE PRINTED -2006. Genuine Vauxhall Astra H MK5 Owners Manual Wallet (2005-2009). Vauxhall Astra Mk 5 User Manual, 2007, Excellent Condition. Owners Manual - which covers the 1.4, 1.6, 1.8, 2.0T (Including VXR model) Petrol and 1.3, 1.7, 1.9 litre Diesel models (Printed January 2006). CD30/CD30MP3 Audio Guide. GOOD CONDITION BUT USED WITH ONE OR TWO MARKS AS YOU WOULD EXPECT. Manufacturer Part Number(s) TS1612B09. Genuine Vauxhall Part. Manufacturer Vauxhall. Model Astra SRI. Product Owners Manual/ Handbook. 6 Gear Manual ( MZ4 ). 9370, 9400, 9500-9504, 9545, 9555, 9560, 9580, 9600, 9625, 9630, 9650, 9675, 9680, 9700-9701, 9760, 9800, 9850, 9875, 9880, 9900, 9900-9901, 9940. Astra Quick Reference Guide (July 2007). Astra Twin Top Quick reference Guide (January 2006). All contained in a wallet, and comprising. This is the instruction book for the factory standard CD30 and CD30 MP3 Audio Systems found in many Vauxhall Models from late 2003 onwards, including the Corsa, Combo, Astra and Vectra. 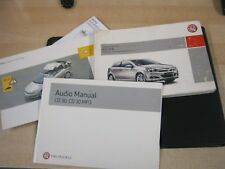 Thank You for Viewing Our Item We Have for Sale one Vauxhall and Opel New Audio manual. This Book Covers The Unit Featured On The Picture. Simply Match The Unit To Your Car and Order. We ship world wide. This item has a weight of 300g and is a very heavy Manual to post All postage on this item outside of Europe is therefore subsidised by approx £1.50 to all destinations. Where we have a lighter smaller manual we will substitute. AUDIO MANUAL CD30,CD 30 MP3. GENUINE VAUXHALL WALLET. OWNERS MANUAL. QUICK GUIDE. Thank You for Viewing Our Item We Have for Sale one Vauxhall and Opel New Audio manual. This Book Covers The Unit Featured On The Picture. Simply Match The Unit To Your Car and Order. VAUXHALL ASTRA OWNER'S MANUAL WITH WALLET (SEPTEMBER 2004). 1.7 CDTi Diesel. Genuine Vauxhall Owners manual for the ASTRA H from 2004 until 2010 Commonly found in the vehicles dashboard glovebox, this item provides detailed instructions on all functions and operations of the car.